Well here it is folks: the Hall Frame reproduction. This was an incredibly fun project and was one that had a profound effect on me. Having actual contact with the original piece (made in 1909) and creating a reproduction in 2009 just made this project that much more special to me. As you can see above, the frame is a fairly accurate copy in terms of overall shape, size and proportions. Its pretty clear that John Hall did something to color his frame, as it has a distinct red color that is missing from mine. I also made a prototype out of alder which will be a gift for my mom, and you’ll see below how dramatically different the mood of the frame is when made with a lighter colored wood. I am incredibly proud of this piece and would like to thank Darrell Peart for putting a picture of this piece in his book, since that’s where I first saw it. I would also like to thank Gary Hall (grand-nephew of John Hall) for giving me access to the frame. And I can’t forget to thank my buddy TreeFrog (Brad) for helping me take measurements and photos of the original, and also for exhibiting an enthusiasm equal to my own concerning this project. 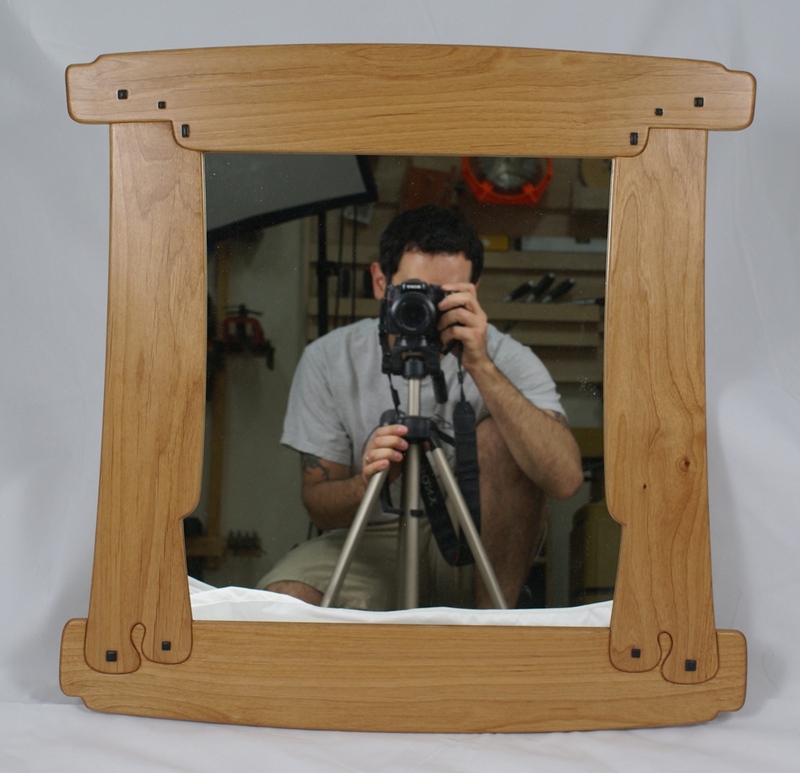 This frame was featured in a Popular Woodworking article and you can download that here, as well as the full-sized patterns. Beautiful!! it came out great, can’t wait to read the article. Nice! Very nice! You do good work. Will your article have enough detail for us mortals to make one? Awesome work Marc. I’ve been waiting to see this and it looks amazing. Can’t wait to read the article. Comparing the two, I see one other subtle difference (other than the color). Grain pattern. At least, that’s what I see from the (smallish (Give us big pictures. We can take it.)) photos. It looks to me that the original has a curved pattern in the verticals that accentuates their curved shape. Correct me if I’m wrong, but the original looks like mahogany and yours appears to be walnut. If so, that would explain some of the difference in color and grain. The original also looks like it was stained, or has darkened from age. Well my original thought was mahogany as well, when I saw it in Darrell’s book. But after seeing it in person, several of us were convinced that it was walnut. Some very unique walnut. And I too think it was stained in one way or another. 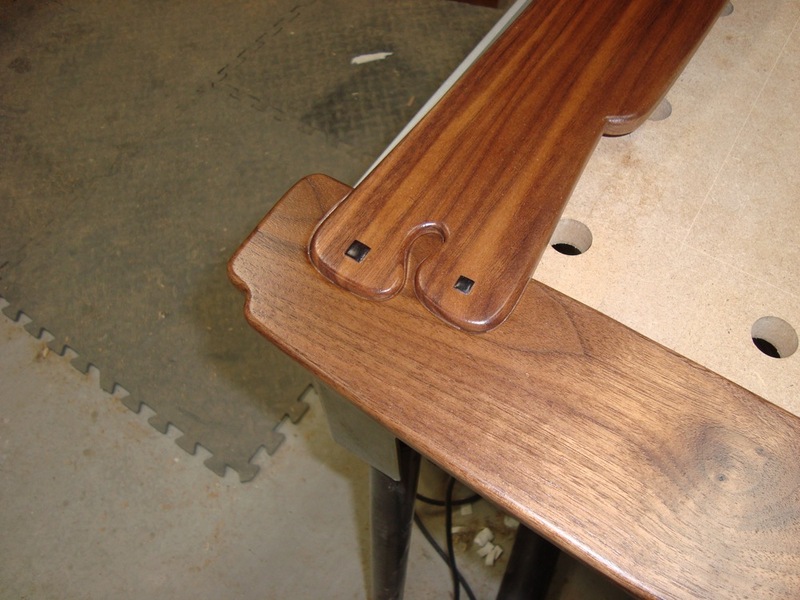 The wood appears to have the kind of crotch grain you see in mahogany, but you can sometimes find similar grain in walnut. Being able to see the wood in person is always better than looking at pictures, so your impression is probably correct. I believe that walnut can be darkened by “fuming” with ammonia. Possibly the original frame was darkened this way. Way to got Marc, you hit this one out of the park. Looks great! Great work as always Marc. I think it’d be really difficult to pick a photo or piece of art to permanently display in that frame. Being that attractive, it’s definitely going to pull most the attention away from what’s being displayed. Please let us know which issue it’s going to be in. I don’t subscribe to PW, but will want to pick up a copy off the newsstand. There ya’ go, a mirror is the perfect answer. Even if you’re having a bad hair day (or hung-over) it won’t seem as bad, lol. Totaly Cool! Great Craftsmanship! It gives me an inspiraton on how to treat a frame that I need to make for a butterfly picture my son (professional photographer)took. BTW the photo you took for your Mom is great. It sorta has a Norman Rockwell style to it. Cool. Beautiful job Marc! I wanna make one too! This whole Darrell Peart – Greene & Greene style thing has really inspired me. Thanks! Your mom will appreciate her frame! Wonderful Marc. I see a lot more Green and Green style in your future. Hey Marc. That frame is really neat. Whenever I see something like this, I always wonder how long it took to make. Did you keep track of how many hours it took to make the prototype, and then how long it took to make the “real” version (not including any overhead associated with taking pictures and/or writing the article)? Hey Russ. I made the frame over the course of about 7 days. But that included one full prototype, one partial prototype, and the finished product. And unfortunately, I can’t really subtract out the article overhead. As soon as I am filming, photographing, or just building with a lesson in mind, the whole thing changes. Thanks Marc, that helps. I’m hearing that the next one would take “a day or two”, if you weren’t doing anything else along with it. Sound about right? If you have the templates ready to go, you are looking at 3 days. Two if you are very fast. Not including finishing time. Thinking about what was popular at the time, I am guessing that the wood might have been treated with potassium dichromate, which may be responsible for the reddish color. You’re probably right. Or possibly potassium permanganate. I love this piece, I originally saw and and drew inspiration from this a while back looking through a book about the Greene brothers. Glad to see someone else has an appreciation for the craftsmen that actually ran the shop for them. The frame turned out great! Do you have an issue assigned for the article yet? I see the humor in the mirror photo !! I can’t seem to find the depth of the frame rabbets in the article or on the site. Can you post them? Hey Joe. The rabbets are 1/4″ deep x 1/2″ wide. 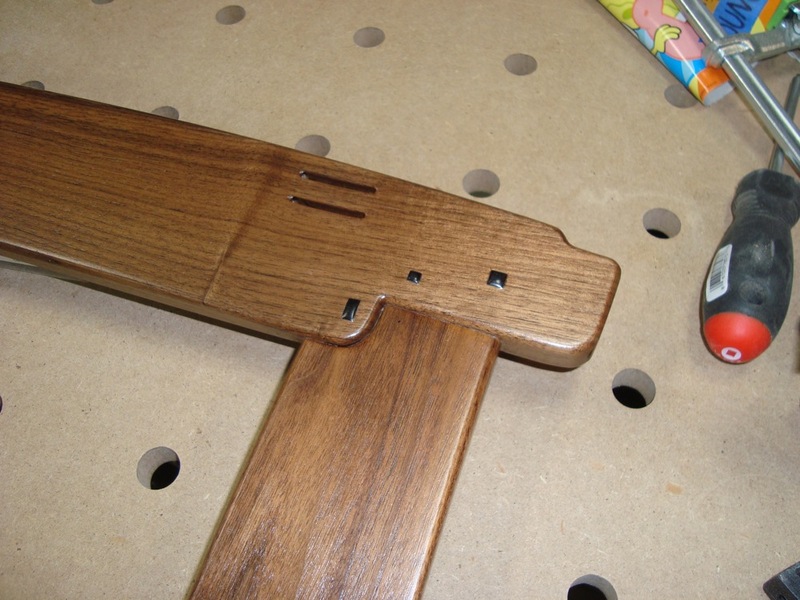 I just read the August Pop Woodworking and would like to try and build this beautiful frame. Do you have any tips for reproducing the curves on the rails and stiles? I laid out the top rail on graph paper the other night using the detail drawing from your article, but when I look at larger pictures, it appears much more gentle than what I ended up with. Is the curve more elliptical than arc-of-circle? I took up WWing back in 2003, had always been interested in it, but I never got truly passionate about furniture till I saw Greene and Greene. I’m remodeling my bathrrom in G&G style and will be using your article for the mirror frame. One question I have: How did you break the edges on the puzzle joint? Hey Marc, do you recall what size flex cut chisels you used for this project? I would like to try this for a Christmas gift this year. Awesome! Marc, did you remove waste from the stiles as well as the top rail to make the top lap joints?